Dax Phelan, veteran screenwriter and producer based in Los Angeles got the Hong Kong bug on a writing research trip to the city in 2005. By his own tongue-in-cheek admission, it had become somewhat tedious being handsomely paid for writing screenplays that rarely if ever get made. Citing inspiration by such auteurs as Lodge Kerrigan (The Killing TV series, Keane) and the Dardenne brothers (Two Days, One Night) Phelan sensed that Hong Kong could be fertile ground for a psychological thriller that would be his directorial debut. He penned Jasmine based on a story that he had co-written with Jason Tobin. While Hong Kong has a truly enormous vault of thrillers with the revenge theme, it begs pointing out that Jasmine is like none of them in several ways. The film is a resolute departure from any of the typical hallmarks of Hong Kong cinema in this genre such as frenetic editing, multi-threaded and convoluted storytelling, and the ubiquitous flashback reveal of everything you could never have figured out without it. For the first time ever, Hong Kong plays a characterful, if inhospitable backdrop to an english language film with artistic sensibilities, a restrained, rhythmical build, and a chilling and thought-provoking climax. It explores themes of loneliness amongst the masses, fear of postponed regret, and most poignantly our ability to invest everything in our own flawed narratives. The deceptively measured pace leaves audiences reaching for handholds as the rug is pulled squarely from their feet. This film could yet spark a new wave of english language productions coming out of Hong Kong that, if made half as well as Jasmine, would win strong audiences around the globe. Jasmine was Tobin's first time heading a feature film cast, but Phelan asserts that he was always confident that he would do justice to his directorial debut. And that he does. Tobin convincingly drops into the awkward skin of his character, Leonard To, a troubled but earnest man recently returned to Hong Kong. Whether once a familiar face about town, Leonard now appears preoccupied, detached, or perhaps even exiled from his urban surroundings. There's a persistent unease about him which over the course of the movie gestates into a kind of cubist portrait; you're never too sure what you're looking at, although the rationale behind his actions seems evident. And here begins one of the key themes of the film, that of a person looking inwards at a place he would desperately like to call home, but for an infinity of reasons may never quite be able to. Ostensibly looking to repair his life after the unsolved murder of his wife a year earlier, Leonard searches for employment and attends group therapy for grieving persons to alleviate his pain. He also reaches out to an old acquaintance, Grace (Eugenia Yuan, The Man With The Iron Fists 2), with whom his interactions can only be described as minimalistic yet steeped in a complex history that poses one of the film's enduring riddles. She treats him with caution in the present, yet flashbacks present a clearly flirtatious tone embedded in their past. Eugenia's acting pedigree is not lost in her fleeting on-screen moments and short dialogue which linger long after the film closes. She reels you in with a mere look, her mental machinations layering up the intrigue. We never quite know who she is, yet she has said so much. Leonard's is a meticulously crafted character whose limited dialogue belies the complex inner workings of a tortured mind. On face value, his plan looks simple and clear from the get-go as he engages in a ritualistic laying of flowers at significant locations that seem to connect with his deceased wife. Methodically beginning the journey of rebuilding work and friendships, his mild mannered and even saccharine behaviour thinly masks a pounding desire to find his wife's killer. 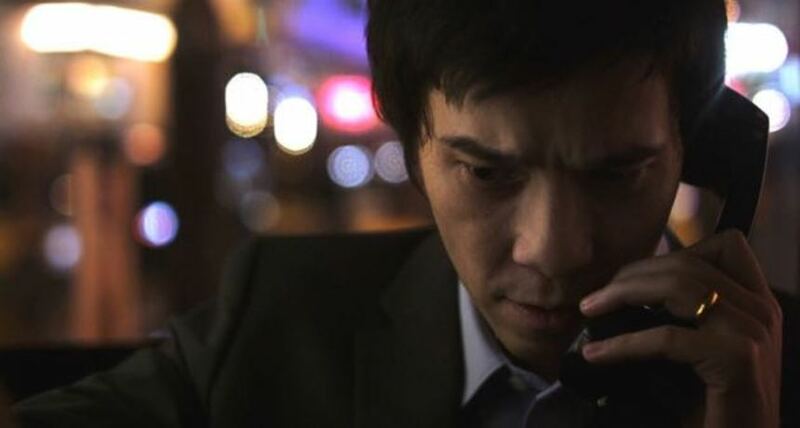 The chance sighting of a stranger (Byron Mann, The Man with the Iron Fists, Arrow; Hawaii-Five-O) at his wife's grave lures Leonard into the next chapter as he goes into pursuit mode, stalking and investigating in a fashion whose hallmark is private-eye meets passion-fuelled revenge. Mann's effortless portrayal of the murder suspect as an archetypal alpha-male is in stark contrast to the diminutive, self-styled investigator, Leonard. But Mann's real skill is to portray the ambiguity of a respectable member of society and simultaneously someone possibly capable of murder, as seen through Leonard's point of view. Leonard's belief that he has a solid lead now, in a case whose formal investigation had clearly dried up, impels him to contact the erstwhile detective with constant updates on his findings. Frustratingly however, when this falls on deaf ears and the police appear to squander his efforts, we find ourselves empathising as the seeds of revenge are sown. But after buying into the picture of a largely balanced, even ascetic man, we might find the late act one revelation of Leonard's weakness for cocaine incongruous. Whether this is to gain confidence or to sharpen his wits before a putative confrontation, this departure from the clean-cut Leonard casts doubt on his ability to carry out any further investigation or revenge smoothly. Indeed, as the Police follow-up appears to paint an ever more hopeless picture, Leonard's vigilanteism adopts a feverish level. Having lured his suspect's girlfriend, Anna, played by Sarah Lian (It's Already Tomorrow in Hong Kong) into a conversation, his veneer of calm control spectacularly implodes when she challenges his assumed identity of detective. Such failures send him across the periphery of social acceptance into manifest outsider status and shift the tension into top gear. The unease with which we viewed Leonard's character at the inception mirrors, in exaggerated form, our own self doubt and is one of Jasmine's more complex underlying themes; the perpetual question we all ask more often that we'd care to admit: how well am I fitting in? Leonard's slightly over-sized suit is a visual metaphor for this in contrast to the sharply cut one worn by his socially well-adjusted adversary. Indeed, we never actually witness Leonard as a functioning member of society; he skirts the perimeter of work and social groups and is forever looking inwards through steel and glass at what is to him the enigma of acceptable society. His nameless suspect embodies all that he cannot be or attain: the corporate job in an ivory tower; cocktail soirées with their cascades of hot girls; a sense of belonging. In the final analysis, Leonard's hunt for the suspected killer is an inquest on his own social exclusion. But for all the noise he makes, the ultimate tragedy is that his voice is simply lost in the crowd. Whilst the story follows a conventional three act structure, sparingly intercut and sometimes ambiguous shots, that could be flashback or fantasy, serve to dislocate our sense of progress as we piggy-back Leonard's increasingly incongruous point of view. But it's too late to jettison because the screw has been turned cautiously slowly, and by the time the jarring and bloody final scene arrives, the ground is well and truly swept from our feet. Thus Phelan achieves a lasting sense of intrigue that goes with you as you leave the theatre. That the movie is done before you know it is testament to its ability to reel you in. Guy Livneh's (Generation Iron, Monster) camera sensitively delivers the isolation and helplessness that Leonard feels. He rarely frames substantially wide shots that would help to orientate the viewer in the scene. Rather he employs handheld, tighter shots that amplify the unease. Jitter also increases to the tune of Leonard's unraveling. Having been shot over five years before the film's release, the then cutting-edge use of the full frame RED ONE camera with sumptuous prime lenses set this picture apart from the lower budget indie pack at the time. And it still looks great with its rich bokeh and excellent colour grade. Jasmine has been given the Hollywood treatment in edit and sound by veteran multi-talent Chris Chan Lee. Having seen early edited scenes, I can attest to his brilliance. The cut shown at the Hong Kong premiere was a polished piece that builds cautiously and crescendos subtly to its grand dénouement. Lee's rhythm has the audience inching their way forwards on their seats and tapping nervously towards the bloody ending. But rather than releasing all those frenetic feelings as we learn the truth about Jasmine, we are left with questions. Not because any great mystery has been withheld but because we realise that we must re-examine all of our judgements for the past eighty some minutes, and indeed must ask ourselves what we missed. The puzzle will sit uneasily for days. It's not a one-shot movie. It beckons re-watching. After substantial applause at the closing credits, the audience filed out in a fog of quizzical chatter, such is the delightful array of hidden 'easter eggs' as Phelan puts it. Who was the woman in the photograph on the wall? Whose hairpin did Leonard really find? What motivated Grace to help Leonard boxing up Jasmine's clothes? In spite of what feels like a cautiously slow build up of events as the movie opens, there's rarely time to catch a full breath before the full eighty-something minutes is up. Many a psychological thriller will sag at some point, yet script, acting and cutting conspire to keep you pinned to your chair for the duration of Jasmine. This film represents not only a fine debut feather in Phelan's directorial cap, but could become a role model in Hong Kong's languishing indie film industry. With better funding next time, we can surely expect Phelan's follow up to set the bar even higher. Looks amazing. Do you have a contact for this film? We'd love to screen it at LEFT in August.